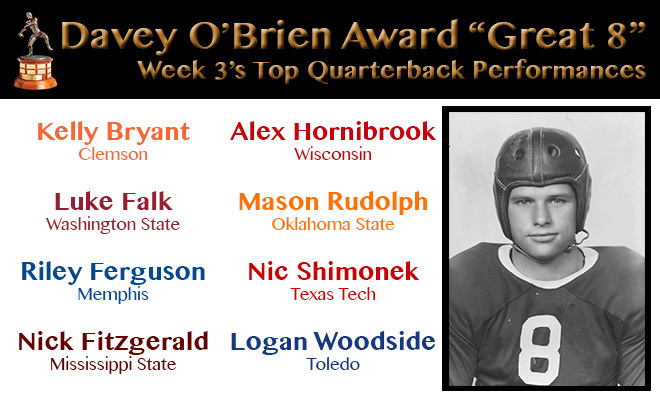 FORT WORTH, Texas (Sept. 18, 2017) – Of the eight players named to the Davey O’Brien National Quarterback Award’s “Great 8” list for week three of the college football season, just one had been previously honored in 2017. 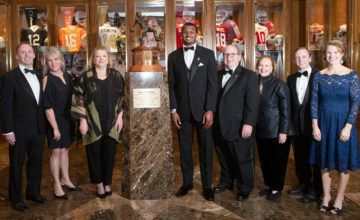 The eight honorees, as determined by voting from the award’s selection subcommittee, are: Kelly Bryant of Clemson, Washington State’s Luke Falk, Riley Ferguson of Memphis, Mississippi State’s Nick Fitzgerald, Alex Hornibrook of Wisconsin, Oklahoma State’s Mason Rudolph, Nic Shimonek of Texas Tech and Toledo’s Logan Woodside. 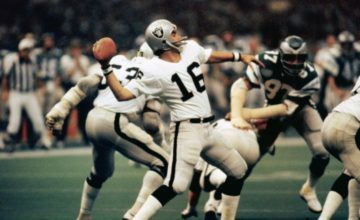 Rudolph, who also appeared on the “Great 8” list in week one, becomes just the third player to be named multiple times in 2017. Through the season’s first three weeks, the ACC, Big 12 and Pac-12 are tied with the most total honorees, with five apiece. Lifted Clemson to a 47-21 victory at No. 14 Louisville by throwing for a career-best 316 yards (22-of-32) and a touchdown and adding two rushing TDs. Threw six touchdown passes, completing 37-of-49 passes for 396 yards with no interceptions, in a 52-23 victory over Oregon State. Was 23-of-38 for 398 yards and a career-high-tying six touchdown passes to lead the Tigers to a 48-45 win over No. 25 UCLA. Nick Fitzgerald, Mississippi State, Jr., 6-5, 230, Richmond Hill, Ga. Totaled four touchdowns (2 passing, 2 rushing) with 266 yards of total offense (180 passing, 88 rushing) to lead the Bulldogs to their most lopsided win ever over No. 7 LSU (37-7). Alex Hornibrook, Wisconsin, So., 6-4, 215, West Chester, Pa.
Set a school record for completion percentage in a game (94.7 percent), going 18-of-19, while netting career highs in passing yards (256) and TDs (4) in a 40-6 road triumph over BYU. Was 23-of-32 for 497 yards, five touchdowns and one interception in just more than a half of play as the Cowboys downed Pittsburgh, 59-21. Finished with 543 yards passing (37-of-50) and threw six touchdowns, five in the first half, in a 52-45 win against Arizona State. Logan Woodside, Toledo, Sr., 6-2, 210, Frankfort, Ky. 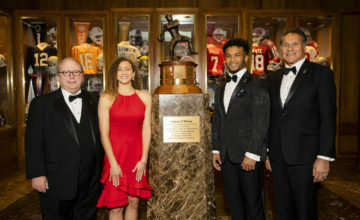 Fired six touchdown strikes and averaged more than 20 yards per completion (22-of-33, 458 yards) in a 21-point comeback victory over Tulsa (54-51).